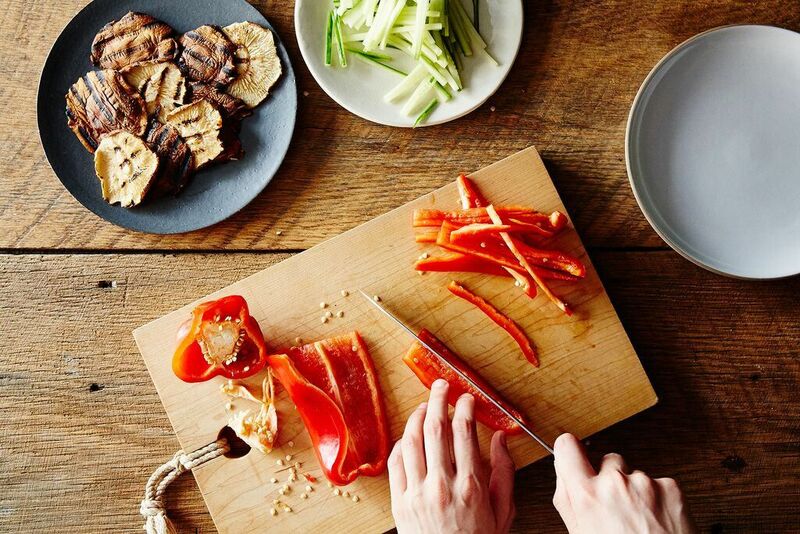 Here at Food52, we love recipes—but do we always use them? Of course not. Because once you realize you don't always need a recipe, you'll make your favorite dishes a lot more often. 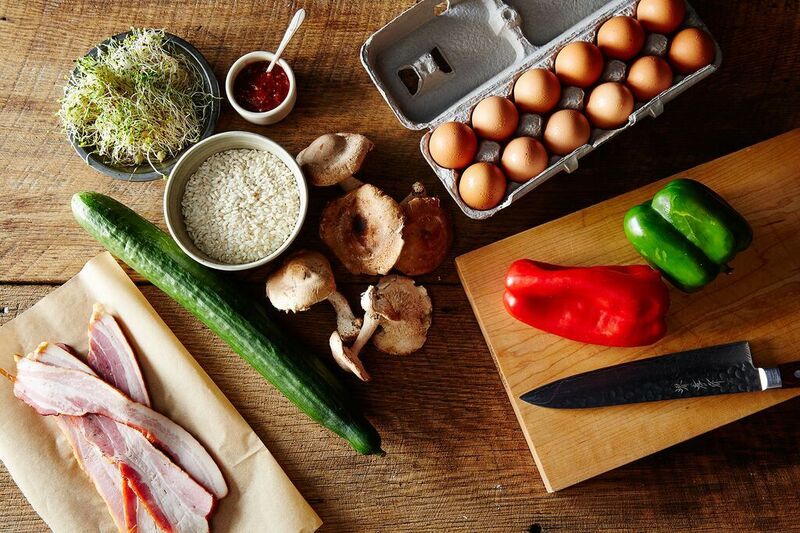 Today: Grab rice, bowls, and a few other things—it's time to go crazy. When I first moved to New York, I was hungry for everything—and so I ate it all. At a tiny Korean restaurant tucked between a comic shop and café on St. Marks Place, I discovered bibimbap. 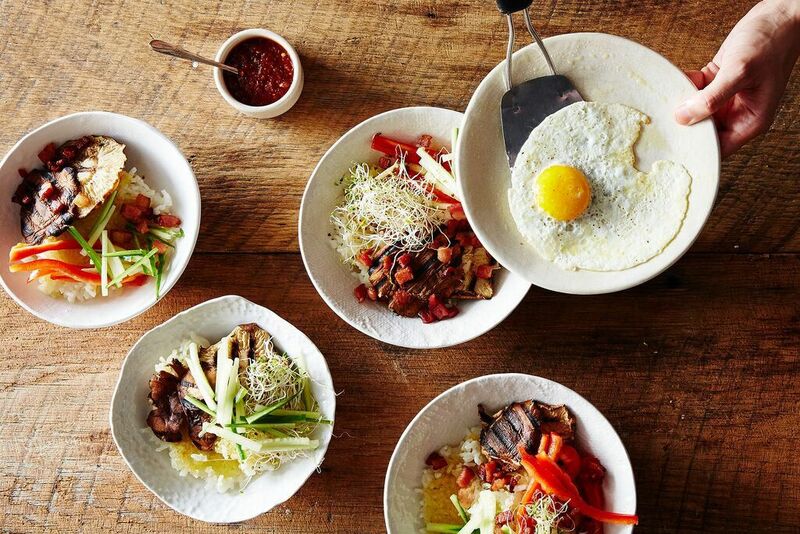 On weekends, a dozen friends and I would cram ourselves into long wooden tables and order kimchi pancakes, spicy Korean fried chicken, and steaming bowls of bibimbap. More: Genius Recipes' Korean-style chicken wings. Bibimbap traditionally arrives tableside in a hot stone pot called a dolsot. The base is filled with rice and topped with an array of vegetables and meat. Right before serving, the chef cracks an egg over the top. You mix the egg into the rice with chopsticks, helping it cook and letting the runny yolk sauce your rice. These traditional stone pots retain heat exceptionally well: The residual warmth crisps the bottom and sides of the rice into a crunchy, golden, paella-like crust. Cooking everything in one pot allows flavors to meld together nicely, so it’s perfectly adaptable to whatever mood you’re in. That said, you can also make the components separately and dish them out into separate bowls; it makes for a prettier presentation. While this dish is technically Korean, the technique for one-pot, egg-topped crispy rice can fit any cuisine. Make an Italian version with rice, pancetta, basil, and tomatoes. Go Chinese: Add peppercorns, snow peas, sesame seeds, and tamari. You could use za’atar, eggplant, chickpeas, and lamb for a Middle Eastern rendition. Cook your rice. I like to use white sushi rice because it crisps nicely, but any variety will work. Thinly sliced steak, cubed lamb, pulled pork, or even shredded rotisserie chicken are excellent options. Plan to cook it before it gets mixed with the other components. I always include crispy diced bacon because I like bacon in everything. If you want to go vegetarian, consider creative ways to bulk up the bowl like crispy chickpeas, fried eggplant, or marinated tofu. 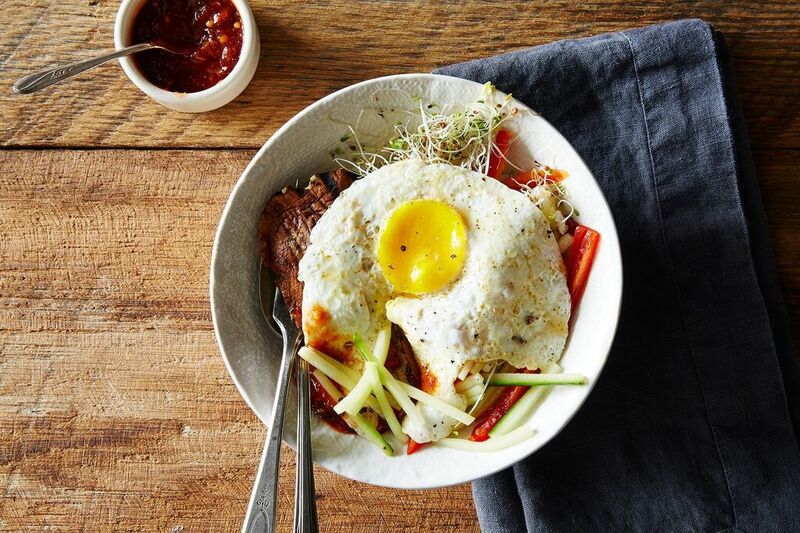 Bibimbap is all about texture: soft cooked rice, crisp rice crust, crunchy vegetables, chewy meat, and saucy egg. Layer on even more texture with your toppings. 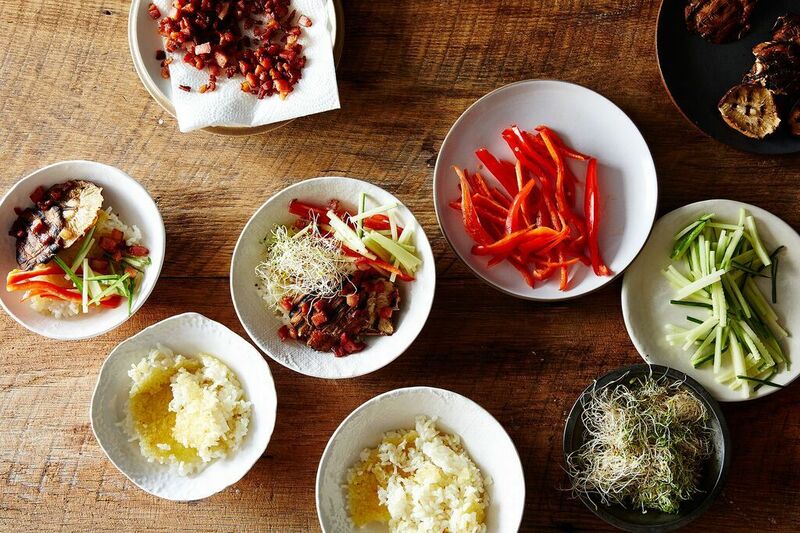 Try ingredients like bean sprouts, sesame seeds, or shredded dried seaweed if you are going with Asian flavors. Some sesame oil and hot sauce over the top before serving. 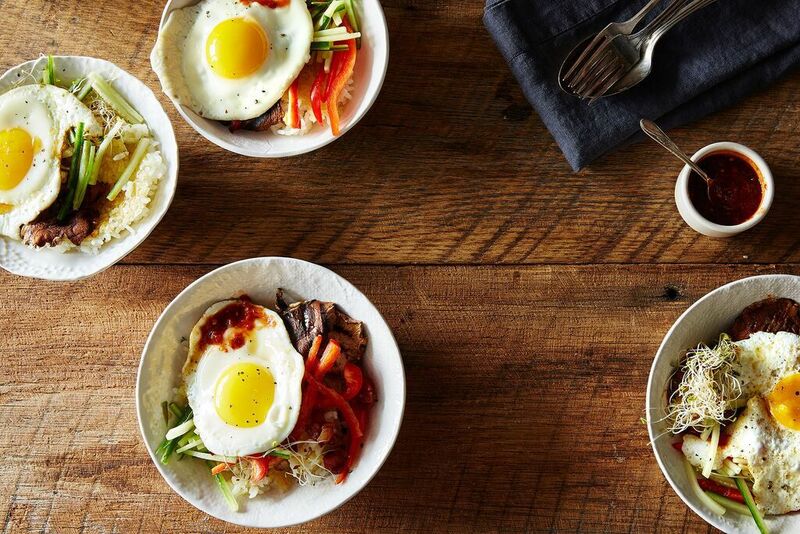 Serving bibimbap in individually plated bowls is a prettier method (and nice for entertaining). The difference in method is you crisp the rice and cook the eggs separately, then compile everything in bowls. 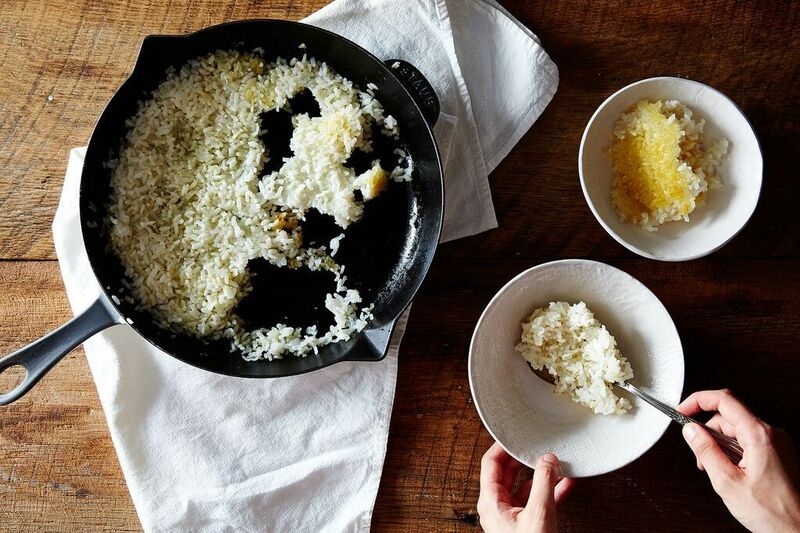 Once the rice is cooked, heat oil in a cast iron skillet, paella pan, or heavy-bottomed pot. Add the cooked rice and let it crisp up on the sides and bottom for a few minutes. Fry some eggs (one per bowl). Cook them until the whites are just set and the yolks are still runny. Top each bowl with an egg, a drizzle of sesame oil and hot sauce, and serve. Use chopsticks to break the yolk and mix all the ingredients together. Here, everything cooks together in one big pot. Choose a heavy-bottomed pot with a lid. If you have a large enough cast iron pan or paella pan, use that. A Dutch oven will work. A traditional dolsot or stone pot is ideal, but not necessary. Heat some oil in your pot until very hot. Add the cooked rice and cover, letting it cook for a few minutes. Next add the vegetables and meat. Crack an egg (or multiple eggs depending on how many people you are feeding) over the top. Cover the pot and remove it from the heat. Keep the pot covered for a few minutes to allow the egg to start to cook. Remove the cover, and stir it all together before serving. Either way, you'll end up with a variety of flavors and textures that'll make you realize bibimbap is the new (or the original?) grain bowl. Can you add beaten eggs rather than just cracking an egg into the rice? I'm loving this way of making it. I fry my egg too. Also I put curry chicken or seafood on top. Something a bit different. I am amazed to see Tah Dig anywhere but in Persian cuisine! And the egg added on top is also common in Persian cuisine. Great article!! You are so right, this is exactly how Koreans eat at home a lot of times. We just mix whatever banchan (side dish) we have and mix it up with rice and gochujang. As long as you have rice, gochujang sauce and some veggies, you are good to go! Meats are def. a plus but even that is not necessary. I really messed up the seasoning on my cast iron pan when trying to make crisp-bottomed rice. Perhaps I didn't use enough oil, but I would not recommend it. I've heard others having similar problems.